Exhibitions, Business Matching, Workshops, Talkshows, Goal Line Technology, Football Industry Displays, Network Party, Seminar Talent Valuation & Sports Media, Games, Product & Business Presentation. "Bringing The World Of Football, Goal Line Technology, Football Industry Displays, Network Party, Seminar Talent Valuation & Sports Media, Games & Presentation." 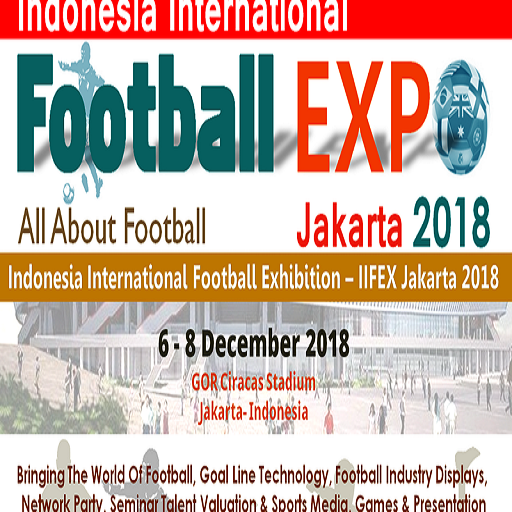 The Indonesia International Football Expo (IIFEX Jakarta 2018) is the first event in Indonesia where all innovations in the field of football are presented. The theme of the event is football and all things related to it. The IIFEX Jakarta offers a range of products and services regarding the football industry world wide. Showcasing more Football equipment and inventory manufacturers, stadium building and maintenance companies, supplements, football academies, sports agencies, sports clubs, entry ticket systems installation companies, ticket programs companies, training camps and sport tournaments management, sport medical organizations, educational establishments, football and marketing agencies, sport equipment wholesale companies, sport surface manufacturers, insurance companies, sport equipment suppliers, football games analysis software developers, security television and CCTV companies, spectators security providing technologies developers and many others will be present at the Indonesia International Football Expo - Jakarta. We are looking for Sponsors for the Indonesia International Football Expo Jakarta 2018!